Photos courtesy of Brentwood Higman and Erin McKittrick, of Ground Truth Trekking, of Seldovia. 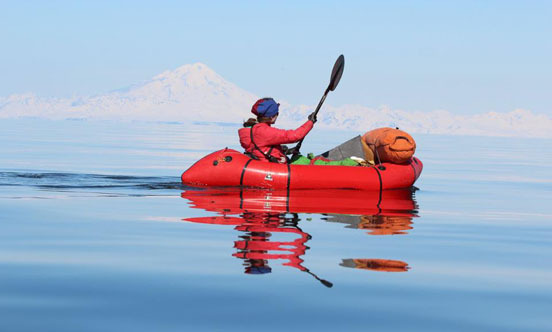 Seldovia’s Brentwood Higman and Erin McKittrick, of Ground Truth Trekking, are navigating around Cook Inlet with their two kids, seeing some interesting sights along the way. 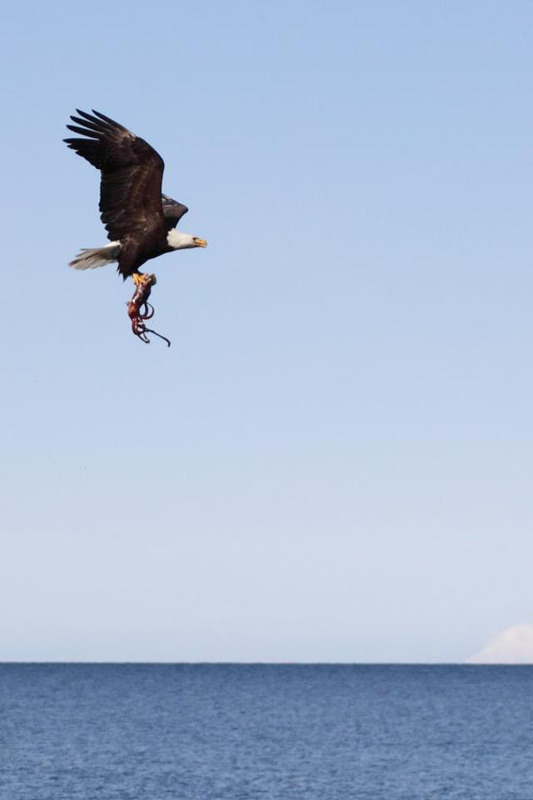 Here a bald eagle snatches a tasty meal, a squid, from the waters of Cook Inlet. 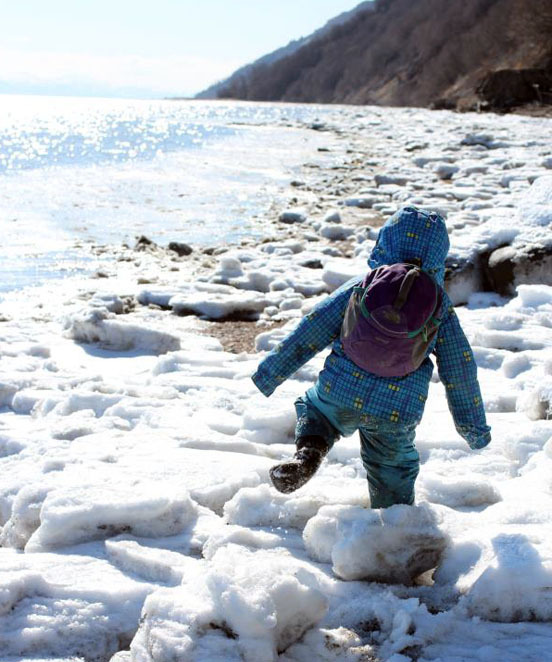 For some people the idea of even taking their kids to the grocery store is daunting, so imagine trying to take a 2- and 4-year-old on an 800-mile trek around Cook Inlet. That’s exactly what Brentwood Higman and Erin McKittrick, of Seldovia, are doing, joined by their kids, Lituya and Katmai, in an effort to find out what people they encounter along the way think about the future of Cook Inlet 50 to 100 years from now. Why Cook Inlet? According to Higman, because it’s a place where all the diverse issues of Alaska’s future collide with the diversity of all its people. “Cook Inlet is the heart of modern Alaska. It has Native villages and Russian villages, hippie towns and tourist traps and Alaska’s biggest city. Cook Inlet is our home. It’s home to oil rigs and natural gas plants, coal mine proposals, wind turbines and tidal power proposals, endangered whales and abundant bears, salmon and melting glaciers. It’s home to most of Alaska’s population, and hundreds of miles of nearly unpeopled wilderness,” he said. They began this expedition March 27, starting from Dogfish Bay just south of Nanwalek, and while this is a huge undertaking with two small children, it is not the couple’s first big trip. Higman, who has a doctorate in geology, and McKittrick, with a master’s degree in molecular biology, have taken 10 walks, starting with their first trek in 2001 from Drift River to Chignik. After graduating from the University of Washington, they launched their biggest effort by walking and paddling their way from Seattle to False Pass in 2007-08. McKittrick’s book, “A Long Trip Home,” details that epic wilderness adventure and all they discovered and learned along the way. They took their oldest child, Katmai, on an expedition around northwest Alaska’s Chukchi Sea in 2010, when he was still a baby. The next year, the family set off for Malaspina Glacier for a two-month trek with Katmai and Lituya, when she was 1. McKittrick’s second book, “Small Feet, Big Land,” coming out this fall, will detail some of those adventures. Even though they have practice, walking and occasionally pack rafting Cook Inlet with two small kids is a lot with which to contend. Slogging through soft beach sand, leaning into biting cold north winds and toughing out the discomfort of seemingly incessant rain. But Higman said that they’re a family and that’s how they roll, and walk, and paddle. 4-year-old Katmai toddles along chunks of ice brought in by the tide. For those who prefer to only experience the environment on nice days, or limit it to walking from their car to their home or the office, it may be tough to comprehend how this family is dealing with the weather along the way, particularly in as long-lingering a winter as this has been. “Does driving rain build character? I’m not sure, but I guess that’s the experiment we’re trying. Engaging Katmai as he walks, and Lituya as she rides and sometimes walks, is certainly a challenge. But we take lots of long breaks, look at interesting things along the way, and it’s been working out really well. In many ways, parenting in the wilderness isn’t really that much different from parenting a 2- and 4-year-old anywhere. Our kids are just regular kids, and have their share of unreasonable tantrums, sibling squabbles, take forever to get dressed in all their gear and out of the tent. But overall, I think we have a more engaging environment in what we’re doing, and a more relaxed schedule,” Higman said. They had planned to walk Cook Inlet, but bringing the kids meant doing it at the pace of those little legs, so they created their plan with an intended average of only eight miles a day. Last week they passed through Kasilof, Kenai and Nikiski, and are currently on the long stretch to Hope, but they said the kids are still faring well. “Lately we’ve been rafting about half a day out of every four days or so, mostly controlled by weather. In that half day we’ll go a full-day’s walking, so in distance it’s about one-quarter to one-third,” Higman said. “The big picture is good,” he added, “and there are myriad details and specifics in that. One thing that’s been harder than expected is we didn’t realize how consistently we’d get north winds walking up the coast here. 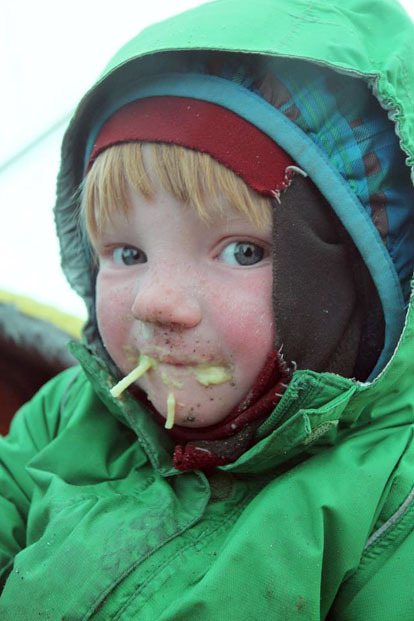 Headwinds make paddling hard, and when it’s cold or wet that can be tough for the kids. The family uses pack rafts when necessary — to cross river mouths or skirt dangerous sections of bluff. “They’ve acclimated pretty well at this point, though, and even in (last week’s) strong winds had a fun time. Katmai is up to walking over seven miles in a day now, which is pretty good for a 4-year-old, and he’s gotten in the swing of the long beaches. Carrying the gear for the whole family is still tough, with just one pack and a few smaller bags, but it’s working out. We have some hard decisions ahead about dropping heavier cold-weather gear and picking up some things like a bear fence,” Higman said. Along the way they have welcomed the kindness of people who have come down to the beach and walked with them, bringing them baked goodies or inviting them up for a meal. They’ve also been heading into villages and towns along the way to repack food supplies that offer needed calories, yet are able to endure days without spoiling. “Things like spaghetti and cheese, oats, potato chips, chocolate … everything that is very dry,” Higman said. Not one to focus solely on the arduous parts of the trek, Higman said that most parts have been not just enjoyable, but at times awe-inspiring, particularly some of their encounters with rarely seen wildlife, such as pods of curious belugas, and on one occasion they documented a very rare meal for an eagle. “Erin and the kids watched an eagle catch a squid, which is just plain bizarre. There’s a picture on Facebook of that, which has gone a bit viral,” Higman said. “Lots of amazing sunsets, bizarre ice forms, wildlife. So far no bears, and nothing that seemed particularly dangerous. Actually, I think the worst so far has been the rocks rolling down the bluffs. We’ve had to be very selective about campsites, and when possible we don’t walk near the bluffs. We’ve seen some pretty big boulders make their way downhill fast. 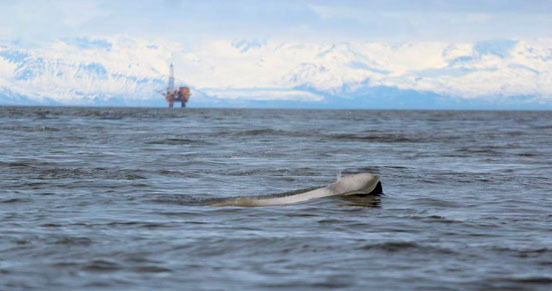 A beluga whale surfaces in Cook Inlet on May 1, with an oil rig in the background. “We’ve had a lot of fun exploring new places, camping on interesting beaches and playing games with the kids. But I’d have to say the most fun has been meeting people along the way. We’ve had numerous very generous hosts and interesting discussions,” Higman said. As they continue on around the inlet to the final destination at Cape Douglas, they said they are hoping to inspire people in myriad ways. “One simple thing that’s come out of traveling with kids is that we hope we can be an inspiration to other families that they can get outside and do more than they think they can. I think it’s pretty easy for people to be overwhelmed and just stop getting outside as much once they become parents, and that’s unfortunate for everyone involved. I think it’s good for people to be immersed in environments not built for humans. “On a larger scale, I mentioned this question we’ve been asking everyone, ‘What changes will Alaska see in the next couple generations?’ The answer always seems to be a complicated conversation covering a broad range of topics, and our goal with this is to learn, and to stimulate that conversation. Keeping clean is a subjective term when trekking with two small kids. “I think it’s easy to think just about the next few years or even less time. But people do have ideas about what might happen in the distant future, where the little kids of today are grown with children of their own. And these ideas do influence our decisions — often very important decisions. A lot of what we’ve heard is fears about the future. We’ve heard people talk about their concerns about declining salmon, population growth, depletion of nonrenewable resources, economic changes and climate change. We’ve also heard hopes — about the power of community and about the potential of new technologies. Everyone we’ve talked to thinks that there will be big changes ahead, and everyone seems to see the ability to adapt as important to the future,” Higman said. The family’s travels can be followed on their Facebook page, http://www.facebook.com/pages/Ground-Truth-Trekking/ 316861406084, or at http://www.groundtruthtrekking.org/Journeys/Around-Cook-Inlet-Expedition-2013.html.